The charts on your left are typical of what Michael Oliver produces not just for precious metals and major stock and bond markets but for virtually every traded market under the sun. I have never found a technical analyst that better fits my needs as an investor than www.OliverMSA.Com, because it allows me to know with a high degree of confidence which side of any given market I wish to be on. 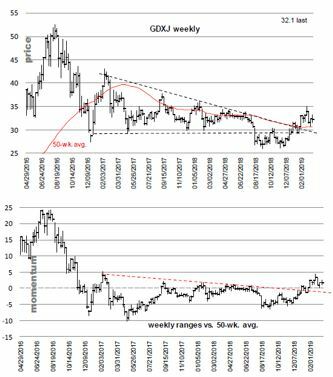 Above left is a price chart for GDXJ, the ETF that holds smaller-scale gold mining and gold exploration companies. Almost always, Michael’s lower momentum charts give a buy or sell signal at an earlier, more advantageous price than price charts provide. While every stock covered in this letter has its own story and price action, what this ETF shows is that our sector as a whole now has some wind at its back. These charts were sent out before the markets opened on Friday, March 15, with the ETF priced at $32.10. It closed at $32.33 on Friday. Here is what Michael said related to these charts. “Long-term momentum – Here we use a 50-wk. avg., which is roughly a 1-yr. avg. “Price chart – The price chart floor at $30 (with one low weekly close not far below $30) came out in August 2018. And the consequence of that seemingly severe price chart demolition ended several weeks later. Why did it not continue due to the severity of the breakage? After all, a couple years’ worth of price lows were violated. We bet the bears are still trying to figure that one out. “Momentum chart – The August 2018 downside action did not threaten the lows going back to late 2016, as price did. Instead, momentum only took out lows going back to late 2017—about nine months of lows. Meaning momentum did not confirm the price chart’s weakness. The momentum lows of late 2016 and spring 2015 were not approached. Then, in fairly tight agreement, price and momentum emerged above trend structures that traced back to early 2017. For price, the post-breakout surge halted at $35, not taking out prior rally highs. But for momentum, all highs except the sole high in early 2017 were taken out. So on the downside momentum did not agree with price’s weakness, and now momentum is driving north far stronger than price. We suggest momentum be trusted more than price. It was the case back at the August 2018 lows (price looked like hell, but momentum did not reflect that degree of weakness) and now while price is positive, but momentum is far stronger. Now look at the recent drop. Both charts have pulled back roughly to the levels they broke out above a few months ago. And they have since stabilized. Yes, there might be more congestive action above those breakout levels, and maybe even more of a pullback, though that’s looking less and less likely.